At 19” x 25.5” x 5.1” (483mm x 650mm x130.1) and 27lb (12.3 kg) the NORCO RPC-3216 is massive and heavy. With loads of space and plenty of flexibility to move motherboard mounts wherever you need them. Almost any system will fit inside. Depending on your perspective, support for standard ATX power supply units (PSU) will either be a good or bad thing. For me, it was one of the reasons why I chose the chassis. As mentioned previously, the RPC-3216 supports the 16 hot swappable SAS/SATA drives via four (one per row) MiniSAS connectors. Unfortunately, they are inconveniently located in the center of each row with the corresponding MOLEX power port on the far left (bizarrely, almost as far as they can be from the PSU). Unwilling to be left out of the ‘why-is-this-here’ competition, the MOLEX power connector for the three 120mm fans is even more inconveniently soldered to the power plane just inside the finger-unfriendly wire access slot where everything is intended to be routed. As poorly thought out as the power connectors and wire routes are, it is nice that two 2.5” drive and one slim-line optical mounts are available on top of the main disc storage area. Also, the internal cooling fans are placed inside a convenient bracket which makes it very easy to slide them in/out of the line. Making it easy to remove and replace them. 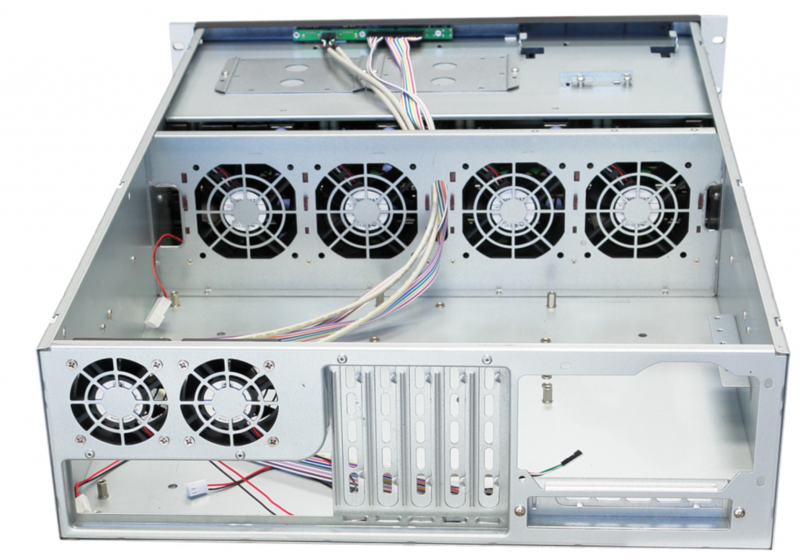 Complementing the three 120mm fans, NORCO included two 60mm exhaust fans above the back I/O panel. None of the fans are particularly quiet, but in this application (i.e. it’s a server), that is not a bad thing and they do a good job pulling air from front-to-back. Thankfully, they are not nearly as loud or whiny as most server fans. Having looked at the pictures above, you might reasonably wonder – what is this image for? Well, it is what NORCO claims the RPC-3216 should look like inside. Specifically, with four 80mm fans and a center wire pass-through. Frustratingly, it addresses many of the complaints I have with the layout of the RPC-3216 above. 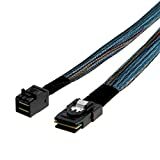 Although, the MOLEX connectors still appear to be as far from the PSU as possible. But, at least there is a wire for the fans in this chassis. Which means NORCO has done a very, very bad thing. They significantly redesigned the product, but did not change the model number. Making it impossible to determine which case you are buying. After doing some research, it appears that this is not exceptional behavior on their part. Somewhere out there, a version of the RPC-3216 that does not support standard ATX PSU exists. Confounding the problem, it is unclear which way they changed it. Is the RPC-3216 that I received a newer design and they never updated the website, or is this the new one? Fortunately, both of the PSU tested with the NORCO RPC-3216 (Rosewill 430W 80+ and Corsair 750W 80+) provided cables with 4-pin MOLEX connectors that would reach all the way across the case. They could then be manipulated into position to provide power for the hard drive rows and the fans. But the 0.5m/1.6’ MiniSAS cables I bought to connect the motherboard to the drive array were not long enough to make the loop via the long way. So, I ended up creating a shortcut by removing the center fan. Routing power and SATA for the two RAID1 OS SSD alongside the MiniSAS cables through this channel. I do not expect that removing 1/3 of the air pulling capacity will be an issue for my environment, but in a more traditional server room (read hotter) it definitely something to keep an eye on. Even with a MiniSAS cable long enough to make the long trip around, I suspect that airflow would be severely restricted for the fan on the left. The cables are very thick and difficult to bundle since the need to be routed one-per-row. With everything in place and connected, it is nice to have 16 3.5” or 2.5” hot swap compatible drive bays. But, unfortunately there was a quality control issue where the two trays on the bottom right stick a little. Making it difficult to insert them into the chassis when swapping drives. They WILL go in with some persuasion, so it is not a major concern, but I expected better quality considering the ~$340 price tag. It is also worth noting, that NORCO does not include rails with the chassis. You need to buy those separately and there is no option from NORCO if the rack has threaded holes. After repeated attempts to contact NORCO via email to confirm this, I was eventually able to get an answer by phone – on the second try. 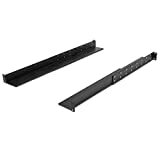 They suggest using the SA-3301 brackets to attach the case to the rear rails of the rack. While I imagine this could work, it would be incredibly inconvenient to try to hold it in place while installing in any cabinet and nearly impossible in mine. Especially considering that even with only eight hard drives installed it weighs almost 50lbs. Fortunately, there are third party options available, with the NavePoint 1U shelf rails doing the job quite nicely. It is difficult to provide a definitive review of the NORCO RPC-3216 because they revised the server chassis on the sly. Quite possibly, some of the concerns around layout and build quality that were experienced in this instance, do not exist with the other versions of the NORCO RPC-3216 and there is no way to tell which one you will end up with if you buy one (which is frustrating). 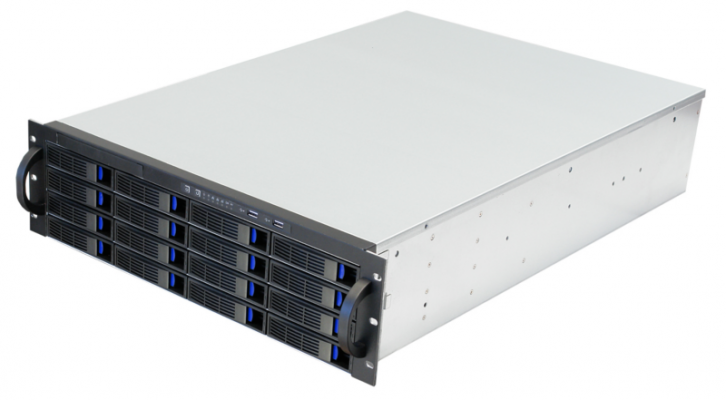 Also, while $325-$350 is relatively cheap for a server chassis with this feature set, it is still a significant enough amount of money to reasonably expect better. A sensible layout, no sharp edges inside, drive trays that slide in/out without sticking, and a company that responds to email or answers the phone to name a few. That said, it works well enough, has the feature set that I want now, and broad support for different motherboards for the future. So, even with these concerns I would probably, sigh heavily, and buy it again.